In the last iteration of this article, we analyzed the top 100 subreddits and tried to understand what makes a reddit post successful by using Google’s Cloud ML tool set to analyze popular pictures. In this article, we will be extending the last article’s premise – to analyze picture-based subreddits with Dataflow – by using Google’s AutoML Vision toolset, training a model, and exposing it via REST to recognize new images. The source code for this is available on GitHub under the GNU General Public License v3.0. Reddit is a social network where people post pictures of cats and collect imaginary points, so-called “upvotes”. Reddit is the 3rd most popular site in the US and provides a wonderful basis for a lot of interesting, user-generated data. We will be partly re-using the architecture of the last article, with some slight adjustments here and there. As we focus on the image recognition part, we upload a training set of images to Cloud Storage (alongside with our manual classifications), train an AutoML model, and access Reddit data via our Desktop using REST. The latter part can be automated in subsequent steps, e.g. using Dataflow and PubSub (you can find some prep-work on my GitHub page). Google’s AutoML is a managed machine learning framework. While it is technically still in Beta, it already proves a tremendous advantage: It more or less automates complex segments of “traditional” machine learning, such as image recognition (AutoML Vision) or NLP (AutoML Natural Language and AutoML Translation). Specifically AutoML Vision enables developers and engineers who are not familiar with the mathematical intricacies of image recognition to build, train, and deploy ML models on the fly – which is why we are going to use it here. While the Cloud Vision API gives us access to Google’s ever-growing set of data (that naturally is used to train the internal ML models), we can use AutoML to train our very own model with specific use cases that a common-ground approach – such as Cloud Vision – might not capture. Now, let’s use one of my favorite topics, cars. The following picture shows the output of the Cloud VIsion API, fed with a picture of my car, an E87 BMW 128i. While it did classify the car as both “BMW” and “car”, it failed to recognize any specifics. Once again, it figured out we are dealing with a BMW, but the fact that the massive hood that houses the beauty that is the naturally aspirated three liter I6, nor the fact that the roof is, in fact, missing told Cloud Vision that this must be a Z4. The main decision criteria here should be: Is it worth spending the extra effort to train your own model? Is your data set so specific and unique that it warrants its own model? Do you have proper Data Scientists in your organization that could do a (better) custom job? In our case – yes, it is. So, time to train our own model, without having to deal with Tensorflow, massive coding efforts, or a Masters in Statistics. As we are trying to extend the idea of image recognition, we first need a set of images to get started on. For that, we will use /r/bmw where people show off their BMWs, mostly E30 and F80 M3s (keep at it folks, I cannot get enough of them). What could go wrong with user-generated content for training sets? A simple script is used to re-use part of our existing reddit/praw and Python setup to simply pull the top posts from the subreddit, filter by the type “extMedia”, save it as image under /tmp and prepare a CSV file that we will use for classification later. The resulting images wind up on Google Cloud Storage (GCS). __author__ = "Christian Hollinger (otter-in-a-suit)"
Now, here’s where the fun begins – we need to classify the training set by hand. It is generally recommended to have at least 100 images per category (Google actually offers a human-driven service for this! ), but we are going to stick to less – it’s Saturday. In order to simplify the model, I dumbed-down my categories – 1 and 2 series, 3 and 4 series, 5 and 6 series, concept and modern, Z3, Z4, and Z8 as well as classics, such as the iconic M1 or 850Csi. The latter introduces way to much noise, however, having a folder full of those cars is fun on its own. Once the labeling is complete, we can train the model from the Web UI. It will warn you that you don’t have enough labels per image. After the training is complete, we can see the model performance. That does not look good. How did this happen? The answer is fairly simple: All of reddit’s images are taken from various angles, in various lighting conditions, and with various model years. The noise in the images is too high to achieve a good result and we don’t have enough data to properly train the model. In order to understand the issue, let’s talk theory for a second. Cloud ML uses TensorFlow to classify our images, exposing the model via an easy API. As usual, this is not a scientific paper – I’m one of those engineer-folks who use the research output, not the researcher. Things will simplified and maybe even wrong. But hey, it works in the end! …we will quickly talk about Convolutional Neural Networks. “CNNs use a variation of multilayer perceptrons designed to require minimal preprocessing. They are also known as shift invariant or space invariant artificial neural networks (SIANN), based on their shared-weights architecture and translation invariance characteristics. Convolutional networks were inspired by biological processes in that the connectivity pattern between neurons resembles the organization of the animal visual cortex. Individual cortical neurons respond to stimuli only in a restricted region of the visual field known as the receptive field. The receptive fields of different neurons partially overlap such that they cover the entire visual field. Given the nature these networks work – by analyzing an images binary components in a set of computational layers – it is easy to confuse the network with seemingly different, albeit actually very similar images. Check out this article by Bharath Ray on Medium for more details on how do overcome this manually. The solution to our problem is fairly simple – we just need a better training set with more data from more images. Car pictures tend to be taken from very similar angles, in similar lighting conditions, and with similar trim styles of vehicles. First, we’ll use https://github.com/hardikvasa/google-images-download to get ourselves proper training images from Google. Ironic, isn’t it? Next, simply create a mock-CSV and quickly populate the classifiers. After getting enough training data, we can go back to AutoML Vision and create a new model based on our new images. After we figured out the issue with our training set, let’s try out the REST API. On point! Well, it is an M3, but that is still a 3 series BMW. Next, remember my old Z4? Yes, sir! That is, in fact, a Z4. First off, using the Cloud Vision API simplifies things tremendously for the overwhelming majority of use cases. It gives you a very accurate output for most standard scenarios, such as detected images not appropriate for your user base (for filtering user-generated content) or for classifying and detecting many factors in an image. However, when the task becomes too specific, AutoML helps us to build our custom model without having to deal with the intricacies of a custom TensorFlow model. All we need to take care of is good training data and careful labeling before training the model. The simple REST API can be used just like the Cloud Vision API in your custom software. I don’t know about you, but I’m a big fan – we managed to build a system that would otherwise require a lot of very smart Data Scientists. Granted, it will not achieve the accuracy a good Data Scientists can (on AutoML or not) – these folks know more than I do and can figure out model issues that I cannot; however, this is the key point. Any skilled Engineer with a basic understanding of ML can implement this system and advance your project with a custom ML model. Neato! In this article (and its successors), we will use a fully serverless Cloud solution, based on Google Cloud, to analyze the top Reddit posts of the 100 most popular subreddits. We will be looking at images, text, questions, and metadata. What is the content of the top posts? What types of images are popular? When is the best time to post to reddit? Is “99% of the Karma” really in the hand of the “top 1% of posters”? This will be the first part of multiple; we will be focussing on the data processing pipeline and run some exemplary analysis on certain image-based subreddits using the Cloud Vision API. Compute Engine or Cloud shell are used to run the data gathering Python script and stores the data to Cloud Storage. Dataflow and Cloud Vision API will be used to process the data and store it to BigQuery. DataLab will be used to analyze & visualize the data. For gathering the initial data, we will use a simple Python script using the reddit praw library. You can run this from your Google Cloud Shell or your local desktop (or a Compute Engine instance). # Self post - no header - askreddit etc. The reason we don’t run this through a distributed system is reddit’s “Fair Use” API policy, which limits us to 1 API call per second, therefore rendering high-performance computing fairly pointless. Before we dive into the data processing on the cloud, let’s quickly talk about image recognition. Google’s Cloud Vision API is a powerful tool to quickly analyze an image’s content and detect its relevant features and relative importance within the image. It abstracts the actual machine learning models from the user and makes it a fantastic tool to integrate in any data processing pipeline, as it doesn’t require you to actually figure out your own model or to train it. While CloudML does enable you to figure all this out with, say, TensorFlow, chances are that a lot of use cases will not require that level of effort. As you can see, the seemingly main content of the image, the animal, has a relatively low score, as it is only a small part of the image. It did, however, interpolate the fact that this was taken in the zoo (as opposed to in the wild) based off the image’s other features, such as the artificial riverbed. Here, we can clearly see that the model correctly identified the content, but got into a much higher level of detail, given the absence of noise from the surroundings. In the next step, we utilize Cloud Data Flow to process the data further. Dataflow is based on the Apache Beam API and is an auto-scaling data-processing framework. It follows a fairly simple programming model in either Python or Java, relying on immutable, distributed collections (PCollections) and functions that get applied to one line of an input file at a time. Dataflow is fully managed (serveless) and auto-scales to more processing nodes when required. Similar to Apache Spark, Beam can use the same code for streaming and batch data. You can also run it on e.g. Flink or Spark, but for the sake of having a serverless architecture, we will focus on Data Flow. For more details, I will refer you to the official Apache Beam documentation. First off, we read the initial JSON and decode it to a Python dict. The current example reads one JSON at a time; you could also read multiple files. The code also splits the inputs by their type tag to identify images. Next, we get the image from the data, store it to GCS, apply the VisionAPI, and finally return another dict for our images table. We resize the image to ensure we don’t hit the Vision API’s 10MiB file limit per request. The resulting data contains the unique ID of the post, the subreddit, and label, and its specific topicality (the relevancy of the detected feature in the image) and its score. * As a disclaimer – it is generally speaking not a brilliant idea to run a very expensive operation – like multiple REST calls – on a pipeline. For the sake of simplicity, we will stick to the idea. To take a look at the resulting data, we run a simple BigQuery query on the Web UI to take a look at the post prominent features of some hand-picked subreddit, for instance, /r/pics, where people post pictures of all sorts of things. Keep in mind, the BigQuery Preview feature is free. We can see an overview of posts, upvotes, comments, the content (in this case, a link to the image), and the id. We will use this data to process the data further in DataLab. For analyzing the data, we use DataLab. DataLab is pretty much comparable to Apache Zeppelin – a live, web-based notebook that enables us to analyze data and visualize it in notebooks that can be updated lived and easily shared, based on Jupyter. It exposes all Google Cloud components in a simple Python environment where we can work on our data with Pandas Dataframes. If you are familiar with Apache Spark, this will come naturally. In order to get our data, we use the %%bq directive in DataLab to store our query results form BigQuery into a variable. We then expose it to a Pandas Dataframe to take a look at the top results – you can run further data processing here. Next, we plot our results using our Pandas DataFrame from before. As we can see, apparently having a lot of (seemingly beautiful) sky in your pictures gets you far. Trees, water or girls seem to help as well. Finally, let’s look at how the Vision API labeled one of the top posts, “Almost slept through this amazing sunrise at Monument valley, was glad I went out anyway! USA (OC)[1920×1920]” by /u/crpytodesign with 30k+ upvotes and ID ae99d5a9e877f9ce84087516f1170c70. Granted, this is not exactly an in-depth analysis – but it does illustrate the point on how to work with the data we gathered. Google Cloud bills you based on usage and the services we are using scale automatically. While certain services are offered free of charge, it is still important to understand that the cost of the deployed solution will be based on your job’s efficiency and data volume. While you can control the maximum number of workers, an inefficient job will rack up costs fairly quickly. Which results in an inefficient query that has to read a huge set of data will result in an equally huge bill. Keep in mind that using LIMIT operations will not affect this, at it depends on the columns and resulting data volume that your query processes. Regardless of this – and other, more enterprise-level considerations – Google Cloud provided a great backend for a solution which would have been undoubtedly more complicated to realize using traditional Hadoop methodologies and tools. In the next iteration of the article, we will run some more in-depth analysis and run a similar pipeline on other types of posts, such as text-based submissions. In this article, we will use Heron, the distributed stream processing and analytics engine from Twitter, together with Google’s NLP toolkit, Nominatim and some Machine Learning as well as Google’s BigTable, BigQuery, and Data Studio to plot Twitter user’s assumed location across the US. We will show how much your Twitter profile actually tells someone about you, how it is possible to map your opinions and sentiments to parts of the country without having the location enabled on the Twitter app, and how Google’s Cloud can help us achieve this. While it is safe to assume that most Twitter users do not enable the Location Services while using the Social network, we can also assume that a lot of people still willingly disclose their location – or at least something resembling a location – on their public Twitter profile. Furthermore, Twitter (for the most part) is a public network – and a user’s opinion (subtle or bold) can be used for various Data Mining techniques, most of which do disclose more than meets the eye. Putting this together with the vast advances in publicly available, easy-to-use cloud-driven solutions for Natural Language Processing (NLP) and Machine Learning (ML) from the likes of Google, Amazon or Microsoft, any company or engineer with the wish to tap this data has more powerful tool sets and their disposal than ever before. Then, we’ll visualize the results with Cloud Studio. Heron serves as our Stream processing engine and local ML, Nominatim on Postgres serves as Geo-Decoder. On Google Cloud, we use the NLP API to enrich data, BigTable and BigQuery for storage and Data Studio for visualization. BigTable (think HBase) is used for simple, inexpensive mass-inserts, while BigQuery is used for analytics. For the sake of simplicity, I’ll refer to one of my old articles which explains quite a bit about when to use BigTable/Hbase and when not to. While the notion of “Hybrid Cloud” warrants its own article, allow me to give you an introduction what this means in this context. For this article, I heavily utilized the Google Cloud stack. The Google NLP API provides me simple access to NLP libraries, without extensive research or complex libraries and training sets. Google BigTable and BigQuery provide two serverless, powerful data storage solutions that can be easily implemented in your programming language of choice – BigTable simply uses the Apache HBase Interface. Google Data Studio can access those Cloud-based sources and visualize them similar to what e.g. Tableau can achieve, without the need to worry about the complexity and up-front cost that come with such tools (which doesn’t imply Data Studo can do all the things Tableau can). At the same time, my Nominatim instance as well as my Heron Cluster still run on my local development machine. In this case, the reason is simply cost – setting up multiple Compute Engine and/or Kubernetes instances simply quickly exceeds any reasonable expense for a little bit of free-time research. The following section describes the implementation of the solution. First off, we are getting data from Twitter. We use the twitter4j library for this. A Heron Spout consumes the data and pushes it down the line. We use a set of keywords defined in the conf.properties to consume an arbitrary topic. Here, we ensure that a tweet contains location information, either from Twitter or via the user’s own profile. You could re-route users that do not use location data to an alternate pipeline and still analyze their tweets for sentiments and entries. The next bolt applies the Google Natural Language Toolkit on two parts of the tweet: It’s content and the location. For this article, we won’t focus too much on the actual content. While it is a fascinating topic in itself, we will focus on the location of the user for now. When it comes to that, things become a little more intriguing. When people submit tweets, they have the option to add a GPS location to their tweet – but unless you enable it, this information simply returns null. Null Island might be a thing, but not a useful one. While a human as well as any computer can easily understand my profile – it means Atlanta, Georgia, United States Of America, insignificant little blue-green planet (whose ape-descended lifeforms are so amazingly primitive that they still think digital smart watches are a great idea), Solar System, Milky Way, Local Group, Virgo Supercluster, The Universe – it’s not so easy for the more obscure addresses people put in their profile. In case you are wondering, “your moms house” is in Beech Grove, IN. The sample set I took most of this data from had only 25 entries and were parsed by hand. Out of those, 16 used ANSI standard INCITS 38:2009 for the state names, but in various formats. A whole 24% used what I called “other” – like “your moms house”. On a bigger scale, out of a sample set of 22,800 imported tweets, 15,630 (68%) had some type of location in their profile, but only 11 had their actual GPS location enabled. For the time, we can conclude that most Twitter users tell us something about their location – intentional or not. For a more scientific approach, here’s a link – keep in mind that my data is a random selection. However – using user-entered data always results in messy, fuzzy, non-structured data. This has been a problem way before the terms “Machine Learning” or “Analytics” exceeded any marketing company’s wildest dreams. Levenshtein-Distance record matching, anyone? At this point, Google’s NLP toolkit comes into play again. We use the NLPT to get all locations from the user’s self-entered “place” to identify everything that has the LOCATION metadata flag. “Oregon” is clearly the location we need. We were able to strip of “upper left” – and could even weigh this based on the specific salience value. But even here, we get the core of the statement – USA – with a high confidence level. The more random place descriptions (such as “a free country”) naturally only produce low-quality results – which is why we should filter results with a low salience score. While this only means “relative to this set of text, this entity is relatively important/unimportant”, it does serve as a rough filter. In order to use more standardized data, we can also use the wikipedia_url property of the NLP toolkit (if available) and extract a more useful string. This results in “Baltimore, MD” to be turned into “Baltimore Maryland”, for instance. However, “Atlanta” turns into “Atlanta (TV Series)” – so use it with caution. The next step, assuming we received unstructured location data, we will try to convert that data into a query for a location service that supports reverse geocoding. Location services and their respective APIs are plentiful online – as long as it is able to convert a query of location data into a set of potential matches, we will be able to use that data. In this case, we are using the Nominatim client from OpenStreetMap. Given the data volume, it is advisable to host Nominatim on Kubernetes or your local development machine – the openstreetmap servers will block your IP if you accidentally DDos them or simply don’t respect their Fair Use Policy – and the velocity of streaming tends to violate basically every Fair Use clause in existence. As you can see, this is not conclusive. So we need to find a way to figure out which result is most accurate. In order to figure out where on the map our result is, we use Density-based spatial clustering of applications with noise (DBSCAN), a clustering algorithm that maps points by their density and also takes care of any outliers. I found this article’s description of the algorithm most conclusive. Short version – for a dataset of n-dimensional data points, a n-dimensional sphere with the radius ɛ is defined as well as the data-points within that sphere. If the points in the sphere are > a defined number of min_points, a cluster is defined. For all points except the cener, the same logic is applied recursively. As DBSCAN requires the ɛ parameter to be set to the maximum distance between two points for them to be considered as in the same neighborhood. In order to set this parameter to a meaningful value, we use the Haversine distance to get the orthodromic distance on a sphere – in our case, a rough approximation of the earth and therefore a result in kilometeres between locations. In our case , r is defined as the radius of the earth, 6,371 km. To combine those, we can use the org.apache.commons.math3.ml package. All we need to do is implement the DistanceMeasure interface (as well as the function for the Haversine distance itself). By putting 2 and 2 together, we get a DBSCAN implementation that accepts an ɛ in kilometers. While choosing the parameters for the DBSCAN algorithm can be tricky, we use 150km / 93mi as the max. Radius of a cluster and assume that a single point is valid for a cluster. While this, in theory, produces a lot of noise, it is an accurate statement for clustering our location set. For interpreting our clusters (and choosing the one that is seemingly correct), we rely on the average “importance” value of OpenStreetMap, which aggregates multiple important metrics (from e.g., Wikipedia) to “score” a place. If the user’s location contains part of a state as String (e.g., Springfield, IL), we increase the importance score during execution. In our Springfield example, Springfield, IL is the state capital of Illinois – and that is one of the reasons why the OpenStreetMap data ranks it higher than the entire Springfield, MA cluster (which consists of Springfield, MA, Springfield, VT and Springfield, NH – despite their combined population being bigger than Illinois’ state capitol). Assuming we have multiple points in a cluster, we take the average between all coordinates in it. This is accurate enough in a ~90mi radius and results in the rough center of the (irregular) polygon that is our cluster. While both methods have their pros and cons, using a geo provider undoubtedly will produce more accurate results, especially in cities like NYC or Washington DC, were we have to deal with close state borders to any given point. For the sake of simplicity and resource constraints, I’m using a singleton implementation of a GSON class that reads a list of US states with rough boundaries that I’ve mapped from XML to JSON. In our case, the result is either New Hampshire or Illinois, depending if we remove Springfield, IL nor not. Now, what tells us that somebody who states they are from “Springfield” simply likes the Simpsons? More importantly, tuning those results is just an exercise in careful profiling. We could filter out obvious countries that are not the US, tune the model parameters or the API calls. One thing we can conclude is that using a combination of well-known, powerful local Big Data tools in combination with managed, equally powerful Cloud solutions opens the door for a massive variety of new analytics opportunities that required a much higher level of involvement and cost only a few years ago. The next steps will be to combine this data with the actual location results, create heatmaps, fine-tune the model, and eventually move the whole solution to the Google Cloud Platform. This article is part 1 of an upcoming article series, Storm vs. Heron. Follow me on Twitter to make sure you don’t miss the next part! When upgrading your existing Apache Storm topologies to be compatible with Twitter’s newest distributed stream processing engine, Heron, you can just follow the instructions over at Heron’s page, as Heron aims to be fully compatible with existing Storm topologies. But is it really that simple? I’ve tried that, using my very much real topology and was not overly surprised by the result. First off, the topology I’m using is my Twitter Analysis topology that reads in tweets (filtered by keywords, using twitter4j), runs a couple of analysis queries on these (based on a prototypical word list from pre-defined reference accounts, basically sh*tty, supervised machine learning for non Data Scientists) and persists them into HDFS, using the storm-hdfs library. I’ll come to the details in a later article; for know, all we need to know is that we use the most recent, stable versions of Storm and an external library that does what Storm does best, stream analysis and simple storage. You have a couple of options for this, I guess. Heron seems to be not able to work with pre-compiled classes containing Storm-objects, so your best shot would be to grab the library and integrate it in your project as regular classes and packages. The other option is re-writing the library. While that seems like an expensive endeavour, it may prove useful if you require more control or flexibility anyways. As I did this in the past with the storm-hbase library for those exact reasons, I’m pretty sure that this is far from a viable option for everyone, but surely it will work for some. Considering the sheer amount of external libraries for Storm (kafka, hdfs, hbase, mqtt, hive, jms, redis …), this could turn out to be a real problem, though. So, if you know of a smarter alternative, let me know! Update: Thanks to the Heron team over at Twitter, the external systems for Heron are work in progress! The solution to this was fairly simple, after the Reflections library failed me as well: I used a custom wrapper object, emulating the Status interface and hence remaining compatible with the rest of my code. Not pretty, but works – and required me to touch code after all. Remember to register these classes as well! Heron surely is awesome when we compare it to Storm – at least in theory. While the idea of literally re-using your entire source with a new, better technology seems thrilling, reality looked a bit less exiting. Anyways, after a couple of hours debugging and using fixes that maybe could be done a bit less brutally, it is now running beautifully on my local machine. Time to test it on a cluster! Heron is in development and things change quickly. These issues might not be true for your setup and there might be a perfectly viable solution to all of this – but I wasn’t able to find it and hence decided to document my experiences here. This article explains how to edit a structured number of records in HBase by combining Hive on M/R2 and sed – and how to do it properly with Hive. HBase is an impressive piece of software – massively scalable, super-fast and built upon Google’s BigTable… and if anyone knows “How To Big Data”, it ought to be these guys. But whether you are new to HBase or just never felt the need, working with it’s internals tends not to be the most trivial task. The HBase shell is only slightly better in terms of usability than the infamous zkcli (Zookeeper Command Line Interface) and once it comes to editing records, you’ll wind up with tedious, long and complex statements before you revert to using it’s (Java) API to fulfill your needs – if the mighty Kerberos doesn’t stop you before. But what if… there were a way that is both stupid and functional? 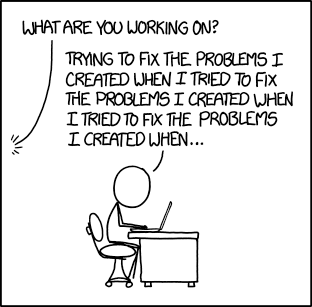 What if it could be done without a programmer? Ladies and gentlemen, meet sed. sed (stream editor) is a Unix utility that parses and transforms text, using a simple, compact programming language. Where: cf:user is the user’s id, cf:action maps to a page on your system (say 1 quals login, 34 equals a specific screen), cf:ts is the interaction’s timestamp and cf:client is the client, say 1 for OS X, 2 for Windows, 3 for Linux. Let’s ignore the redundancy in timestamp and user or the usability of the key – let’s stick to simple design for this. One of your engineers (surely not you!) f@#!ed up and your mapping for cf:client – between 2016-08-22 and 2016-08-24, every record indicating “client” is one off! 1 is now 0 (making me using an NaN OS) and 2 is now 1 and maps to OS X, 2 to Windows – and suddenly, Linux is of the charts. But don’t panic – Hive to the rescue! And here’s what we’re going to do: First, we’ll create our HBase table. Bam, good to go! The table’s empty – but we’ll get to that in a second. Let’s run it with a charming 2,000,000 records and see where that goes. On my mid-2014 MacBook Pro with i5 and 8GB of Ram, the job ran for 9.8 minutes. Might want to speed that up with a cluster of choice! Granted, you would not have needed Spark for this, but Spark is awesome! Also, it’s overhead in relation to it’s performance benefits beats shell- or python scripts doing the same job in many daily use cases (surely not running on a tiny laptop, but that’s not the point). I was forced to use some semi-smart approaches (Spark mllib for Random data and changing the type with a map()-function might be one) – but hey, it works! Next, an external Hive view – the baseline for all our Hive interactions with HBase. Unless you are trying to abuse it (like we’re about to do! ), Hive is a really awesome tool. Its HQL, SQL-like query language comes really natural to most developers and it can be used in a big variety of sources and for an even bigger variety of use cases. Hive is, however, a tool that operates on top of MapReduce2 by default and with that, it comes with a notable performance overhead. So do yourself a favor and have a look at Impala, Tez and Drill or running Hive on Spark. But let’s abuse Hive with M/R2 a bit more first. We now have an HBase table, a Hive external table and data. Let’s translate our problem from before to HQL. In the statement, 1471824000 equals 2016-08-22 (midnight), 1472083199 is 2016-08-24 (23:59:59). If a table is to be used in ACID writes (insert, update, delete) then the table property “transactional” must be set on that table, starting with Hive 0.14.0. Without this value, inserts will be done in the old style; updates and deletes will be prohibited. Apart from setting a table property, we will also need to edit the Hive configuration and change the default values for hive.support.concurrency to true and hive.exec.dynamic.partition.mode to nonstrict. That’s not only something that would usually involve several people (not good for our unlucky engineer), it also requires you to have the table in ORC format – not for us. But one thing Hive can also do is to create managed tables. A managed table (instead of an external table like we created above), the table is more comparable to a traditional RDBMS table, as it will be actually managed by Hive as opposed to be just a layer atop of an HBase table. By defining STORED AS TEXTFILE, Hive manages the data with a set of textfiles on HDFS. This runs a query on our initial, external table and stores the result into HDFS. It tells you not to use M/R2 anymore. For those of you who are still afraid of HexDumps: After the length of each field, the next character is an an 0x01. Or, in other words: Every byte in a line after the last 0x01 byte will be our client variable. Seems like a random sequence of numbers, but is actually a cheaply stored separated file. An ^Asv, if you will. Let’s finally use all that knowledge and do what we came here to do: Increment our client setting! sed -e ‘s/[0-9]$/’$c’/’ replaces every number ([0-9]$) at the end of a string ([0-9]$) with the newly-incremented variable $c. And there you have it! Note the last number increased by one. By the way: sed does not support Negative Lookaheads in regex. Learned that one the hard way. 16,387 invalid records that are immediately spottable as well as those hiding in client 1 and 2 – damn! As 0 used to be an undefined state and the result is now 0 and used to be 16,387, we seem to have fixed our mistake. You can further validate this with a full COUNT(*) or by calculating the differences between the client-values. Also, we simply ignored all the ideas, frameworks and algorithms behind efficient Big Data – its like managing all your financials in Macro-loaded Excel files. It works, but it is inefficient, complicated, unsecure and slow. Let’s see how to do it properly. The idea here is quickly explained: Instead of updating a record, i.e. trying to modify HBase columns directly, our current Hive query is comparable with a simple put() operation on HBase. While we will overwrite the entire record, there is no downside to it – the keys and other information stays identical. There you have it – the same result (no client = 0), much faster, much easier and executed on your distributed computing engine of choice! Welcome to my not-at-all generic blog. I write about nerdy stuff here, most likely Big Data, Analytics and UNIX-related.